Abraham never thought highly of the teaching profession. Long hours, stifling schedules, uninspired students. His own experiences with public school teachers who struggled with their own thankless jobs failed to inspire him. That is until much later as an adult, he took an unexpected detour from his fast-paced high-tech consulting job to head to Asia for what he thought would be a one year missions trip to teach business in China and South Korea. In 2001, Asia was globalizing and opening once tightly-closed borders to the western world. They wanted to learn capitalism in the burgeoning globalization movement, and he had heard there were unprecedented opportunities to share the Christian worldview and the Gospel. In a step of faith, he moved to Asia where God used him to build an international management program at one of the forefront Christian universities there. Asian students’ super academic discipline belied a generation starved of meaning and purpose. It quickly became apparent to Abraham that Asian education was largely rote memory and geared toward technical skills, which left young adults without the foundations for building a comprehensive worldview. Students often couldn’t anchor their life purpose beyond the Confucian values of traditional family obligations, materialism, and achieving high social status. Abraham observed that we all cope with our personal puzzles in different ways. In Asia he saw young people super busy and absorbed with accumulating many, many dots and specializing in obscure fields to some materialistic end. Such puzzle strategies don’t allow for seeing a truly amazing God who gifted us with a universe that bears his fingerprints – his love marks. For Abraham, the goal of education is to guide students toward an introspective narrative of self and the universe as God intended. A largely vocation-oriented education by itself can skew a person’s assessment of the world towards a sterile and vapid view of life where God seems non-existent and impersonal. Our mental puzzles are even more formidable in the information age, where readily available information gives us the illusion that we understand more, when in reality the mental routines for processing this information about the world remain undeveloped and inchoate. The Internet has given us more dots than we know how to use. But as Christians, Abraham believes we can connect our dots through our worldview. Looking back, he recognizes that his life’s journey had been preparing him for his role as teacher from the beginning…. 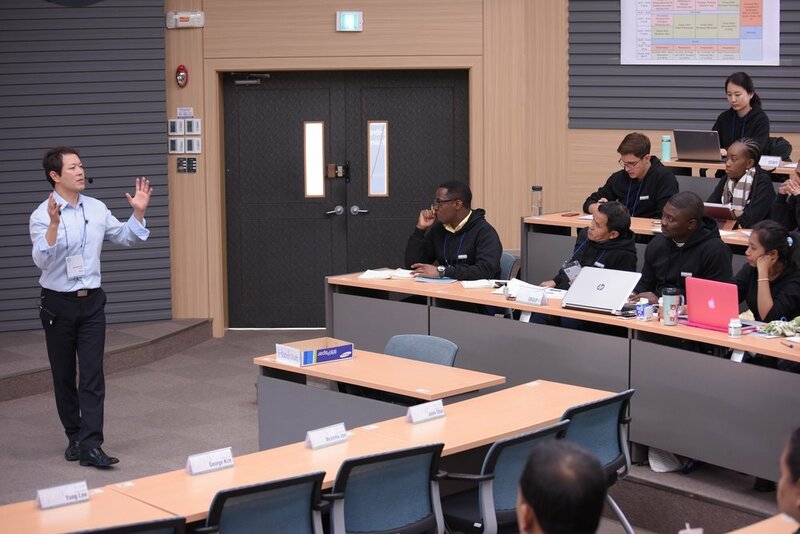 Abraham teaches International Business, Global Entrepreneurship, and Organizational Innovation at Handong Global University in Pohang, Korea. A highly rigorous international university, Handong’s motto “Why Not Change the World” challenges the diverse student body to live by the Christian principles of servant leadership, proactive involvement, and personal integrity. Handong grads move on to positions throughout the world, such as Harvard Kennedy School of Government or to Silicon Valley firms like Google and Facebook. Still others innovate sustainable startups in Africa or SE Asia or join the ranks of the Korean firms Samsung or LG. Abraham’s goal is to help students understand the building blocks of making great businesses and great people. On a deeper level, he wants his students to know: when you do well with the gifts and talents God has given you, you become a dynamic person that extends God’s “garden” in a world of turmoil. You are nourished by both beauty and goodness. You reflect upon God more deeply. His mission is to help his students recognize and understand their individual gifts and talents, and direct them toward God’s path for personal and social flourishing all around the world. In order for an individual to discover his or her deepest passions, Abraham believes they must develop a better understanding of who God is – a journey he is deeply familiar with himself. He does not shy away from discussing difficult topics – suicide, depression, the problems of the modern church. He begins every class with a corporate prayer outlining his vision for his own life and the lives of his students. Being a light and a restorer means sharing God’s beauty with the world. Christians, he says, should be leaders in creative professions. Abraham mentions home renovation shows as examples for other Christians: They take the broken and the ugly and make it beautiful again. In the Old Testament, Isaiah 58:12 says, “Your people will rebuild the ancient ruins and will raise up the age-old foundations; you will be called Repairer of Broken Walls, Restorer of Streets with Dwellings.” To Abraham, this verse is a direct calling to Christians. Christians need to recapture the beauty of Jesus’s life and share it with the world, Abraham explains. The first thing we learn about God in Genesis 1:1 is that He is a creative being Himself (“In the beginning God created the heavens and the earth”). Being made in God’s image means we can’t help but imitate his creativeness, and that carries a deep responsibility. He gives an example: If you’re called to make cupcakes, make cupcakes that make people dance upon eating them. If you’re called to be an architect or an interior designer or an event planner, do it so well that people linger in the spaces you create, bringing about joyful collaboration and fellowship. If you’re called to teach, design student engagement to inspire them to positive action. Abraham believes Christians should be leading the world with their creative pursuits, starting with small things everyday in our daily routines. His passion for mentorship and enthusiasm for the Lord is a culmination of his personal journey. Abraham was born in Korea, and his family moved to San Francisco, California when he was four years old. As an adult, he kept alive a hunger for learning across the academic disciplines. He received his Bachelor of Arts at University of California, Berkeley in both English Lit. and Molecular Cell Biology, his Masters in International Pacific Affairs from UC San Diego School of Global Policy and Strategy, and his Doctorate in Business Administration from IE Business School in Madrid, Spain. During this time, God brought people into his life to reveal how He was bringing down communist borders on the Asian continent. Through a rush of interviews, he joined a Chinese university for the summer and then transitioned to the business school at Handong. Arriving without any grand expectations, he simply wanted to learn about the cultures and the languages. But once he left the United States, his life – and his thinking – started to change. Perhaps most importantly, his view of God changed too. When Abraham visited the John Jay Institute as an alumnus, Crippen invited him to lunch and updated him on the institute “in the most positive, winsome way.” This simple gesture – lunch and good conversation – spoke volumes to Abraham, and he was touched by Crippen’s sincere friendship with all his students. In many ways, Abraham’s relationship with his students at Handong has been formed by Crippen’s mentorship. The love Crippen demonstrated for learning, his passion to grow as he grappled with issues alongside his students, and his ability to listen deeply are all components Abraham mirrors in and outside the classroom today. Abraham is deeply aware of his own attitude toward others. As a role model to students, he often asks himself: what do they see when they look at me? He hopes the answer is always Christ. Perhaps his attitude is made most clear in the corporate prayer he recites with his class. A prayer he believes serves as a summation of the way Christians are called to live. A prayer that acknowledges God as the source of all truth, all light, and all restoration. You are the source of truth, light, life and true restoration. You created us in your image and empowered us to manage and build the world You provided us with using the creative powers which reflect your majesty and glory. Thank you for letting us enjoy this process. Help us to be faithful stewards of your gifts. We want to learn to work with one another in the diversity of our talents using the tremendous world resources you have given to us accountably, sustainably, and responsibly with a humble, grateful attitude. Christ your Son called us to love proactively – first you and our fellow man. By the power of your self-sacrifice for us, you gave us a vision for a full life. Sometimes in the complexities and confusion of life, my future seems distant and unknown. Give me, O Lord, the vision to see the path you set before me today and to be faithful with this day. Grant me courage to follow your way, and use the talents and gifts you have given me to bring your life and love to others.